Santa is Coming- Who is Getting Coal in Their Stocking? The Affordable Care Act (ACA) has become the latest best excuse for any unpopular behavior in the health care sector. Heaven knows there are plenty of issues and concerns that can fairly be attributed to the law- but it drives me crazy when people use the law as an excuse for any ills in the health care system- and particularly when the law becomes an excuse for the denier’s own bad behavior. Those of us old enough to remember Flip Wilson’s tag line “The Devil Made Me Do It” will find that the ACA is used as carelessly as an excuse- but this time there isn’t a laugh line. So in honor of one of our most favorite seasonal personages- who should find Coal in their stocking on Christmas day as punishment for hiding behind untruths about the ACA? I will give you my top four candidates. High-deductible Insurance policies and Narrow Networks are not mandated by the ACA. These are both favored practices in your industry- you tried to use them extensively in the 1990s but had to back down because of public backlash. But now under the guise [lie] of “The ACA Made Me Do It” you are implementing these insurance practices- just like you have always wanted. COAL for lying and COAL for increasing profits at the expense of your insured! I am confident that the vast majority of people in health care are doing their best to provide care that a patient needs- as efficiently and effectively as possible. I am equally confident many health care providers find it difficult to explain to their patients exactly how the ACA is going to change healthcare generally- and their practice specifically. Most physicians (and other health care professionals) are as confused about the ACA as their patients. That is understandable given the enormity of the law and the transition period we are all in. The ACA does not specify what care a patient can- or cannot- have. It does not limit a doctor’s ability to make treatment decisions about what their patient needs. Shame on any doctor, hospital and other provider that used the ACA as an excuse to cut corners, dismiss patients or provide sloppy care this year. DOUBLE COAL for any that used the ACA as an excuse for their own unprofessional, unethical behavior. I would like to throw stones [actually coal] in both directions. To the Conservative Wing: Coal to you for pretending there is nothing in the ACA you agree with. Many of the ideas encompassed in the law predate the ACA to Republican administrations and endeavors. But my particular favorite is the uproar- and a Supreme Court case!- challenging the individual mandate requiring us all to be insured. Really? That was the touchstone of many conservatives prior to the ACA- most notably Newt Gingrich and the Heritage Foundation– and you know it. Your duplicity about “Obamacare” is truly coal-worthy. To the Liberal Wing: People are anxious and confused about the future of health care in this country. It would have helped so much if people had understood the ACA better from the beginning. The Obama Administration should have blanketed the country with TV spots, articles, pamphlets and town hall meetings- but instead it seems the White House thought the benefits of the law would [eventually] become self-evident. Failure to help everyone understand the law has left the country in the dark during this difficult transition- and has left a void where voices against the law fill the void with false information and confusion. Coal for the White House. And Democrats in Congress? Fighting against an important funding mechanism of the ACA– taxes on medical device manufacturers- because they live in your state was bad enough- but delaying the Cadillac Tax? That is pandering to unions pure and simple. Perpetrating untruths and causing more fear about the future of health care in America? I anticipate a fair amount of coal dust in the air this Christmas morning. Thank you Santa! 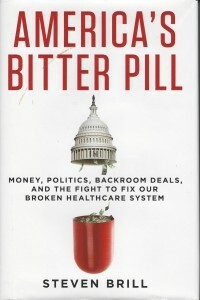 NEW YORK TIMES BESTSELLER • A NEW YORK TIMES NOTABLE BOOK • America’s Bitter Pill is Steven Brill’s acclaimed book on how the Affordable Care Act, or Obamacare, was written, how it is being implemented, and, most important, how it is changing—and failing to change—the rampant abuses in the healthcare industry. It’s a fly-on-the-wall account of the titanic fight to pass a 961-page law aimed at fixing America’s largest, most dysfunctional industry. It’s a penetrating chronicle of how the profiteering that Brill first identified in his trailblazing Time magazine cover story continues, despite Obamacare. And it is the first complete, inside account of how President Obama persevered to push through the law, but then failed to deal with the staff incompetence and turf wars that crippled its implementation. In March 2010, the Affordable Care Act was signed into law. It was the most extensive reform of America’s health care system since at least the creation of Medicare in 1965, and maybe ever. 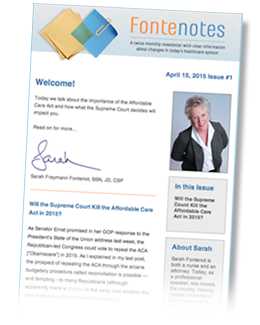 The ACA was controversial and highly political, and the law faced legal challenges reaching all the way to the Supreme Court; it even precipitated a government shutdown. It was a signature piece of legislation for President Obama’s first term, and also a ball and chain for his second. Emanuel also explains exactly how the ACA reforms are reshaping the health care system now. He forecasts the future, identifying six mega trends in health that will determine the market for health care to 2020 and beyond. His predictions are bold, provocative, and uniquely well-informed. Health care—one of America’s largest employment sectors, with an economy the size of the GDP of France—has never had a more comprehensive or authoritative interpreter. In no other country has health care served as such a volatile flashpoint of ideological conflict. America has endured a century of rancorous debate on health insurance, and despite the passage of legislation in 2010, the battle is not yet over. 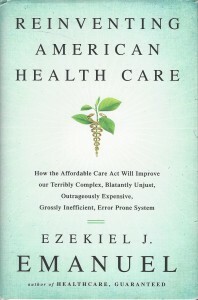 This book is a history of how and why the United States became so stubbornly different in health care, presented by an expert with unsurpassed knowledge of the issues. Tracing health-care reform from its beginnings to its current uncertain prospects, Paul Starr argues that the United States ensnared itself in a trap through policies that satisfied enough of the public and so enriched the health-care industry as to make the system difficult to change. He reveals the inside story of the rise and fall of the Clinton health plan in the early 1990s—and of the Gingrich counterrevolution that followed. And he explains the curious tale of how Mitt Romney’s reforms in Massachusetts became a model for Democrats and then follows both the passage of those reforms under Obama and the explosive reaction they elicited from conservatives. 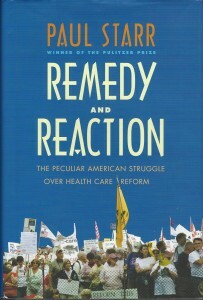 Writing concisely and with an even hand, the author offers exactly what is needed as the debate continues—a penetrating account of how health care became such treacherous terrain in American politics.